RoadRunner CRM is a leading provider of business automation solutions and other services for your growing company. We are a training and consulting firm that specializes in helping small business owners and entrepreneurs quickly grow their business, automatically, on auto pilot to a large extent, and without substantially increasing their costs. We provide our clients with cutting-edge strategies for building sales and marketing funnels, and set them up with a dashboard and automated reports to help them make informed decisions on how to get their business to the next level. We also assist our small business clients in automating business processes, like new client intake, information gathering, reporting, customer communications, etc. 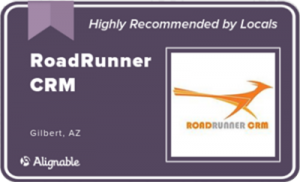 RoadRunner CRM provides cutting edge, long-term consulting and implementation for small businesses that require automation for sales and marketing. We have created a simple and easy to use process specifically designed to save time and money, and provide long lasting results with automation. We are Infusionsoft Certified Consultants and an Infusionsoft Certified Partner. As such, we provide small businesses with powerful Infusionsoft solutions to save time and make money. We provide solutions to automate and grow our clients’ businesses through sales and marketing plans and integrated CRM (Customer Relations management). Infusionsoft is the core of RoadRunner CRM. We provide consulting, coaching, training, and implementation on Infusionsoft to help you get the greatest return on your investment. There are a number of business automation platforms, but for smaller business that want to grow fast, RoadRunner CRM focuses on Infusionsoft as a primary solution. RoadRunner CRM is dedicated to assisting small businesses grow quickly through marketing and sales automation.